Nini, thank you for the links. How did your pumpkin come out? 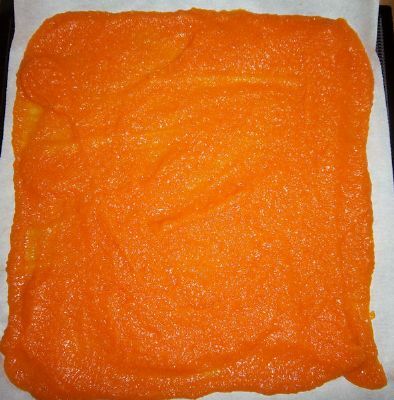 I wonder if you could do the same with sweet potatoes to add to muffins, pancakes, etc. ~Made homemade breads and soups. ~My honey fixed our washing machine. Yay! ~I have been working on organizing more. The more organized I am the more money we save :) Don't ask me how many hole punches I have ! This is only one of the medium-sized pumpkins and part of the small one. All of that pumpkin dehydrated to a little over a cup and one-half of pumpkin powder... or, rather, pumpkin "dust," as our friend Todd teases me. He said he can't wait to be invited over for coffee and pumpkin dust pie! LOL! MEN!!! From what I read, all I will need is 1/2 cup of powder to 2 cups boiling water. 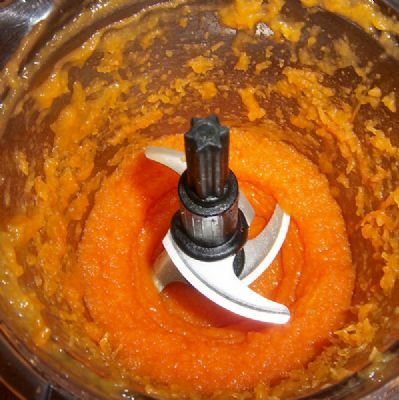 Once rehydrated, I'll have pureed pumpkin for pie or muffins or... well, you get the idea! It's really a space-saver... In the freezer, the pumpkin would've filled two or three gallon-sized bags; but as you can see in the picture, it barely took up half of a quart jar! Pretty cool! I still have a HUGE pumpkin left to dehydrate from last summer, as well as a big squash... Hoping to get to them this week! Pretty neat stuff! I also got two HUGE bags of frozen mixed veggies on sale at Costco last weekend (unadvertised special, I think), and dehydrated them down to fit into two quart jars. 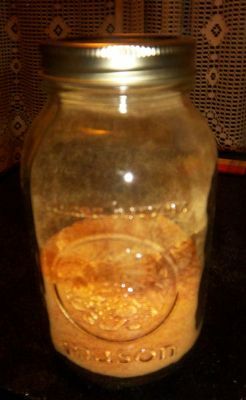 AND I dehydrated four large onions down to a pint jar (my goodness, that was such a strong aroma!). 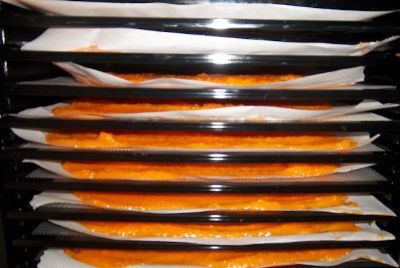 Next I'm going to try dehydrating potatoes... We always save on the mondo huge bag of them, but they always seem to go bad before we can eat them all. I hate that - the whole point is to SAVE money by buying in bulk! Ergo...we're going to give the dehydration a whirl. Wish me luck! We're also still sticking to using only what we have on hand... The chicken was a pre-purchase made months ago. We had run out of potatoes and onions, but I bought in bulk to save, and the veggies were just too good a deal to give up. I'm so excited - our grocery bill has been ridiculously low so far this year. From this point on, if I only by what we need or pick up really good deals in bulk, we're going to be golden. Keeping my fingers crossed and thanking God for all this blessing, that's for sure! Question: What's the best way to remove rings from my canning jars? They are stuck on after being processed yesterday. I really need to get them off in order to wash the jars for storage. 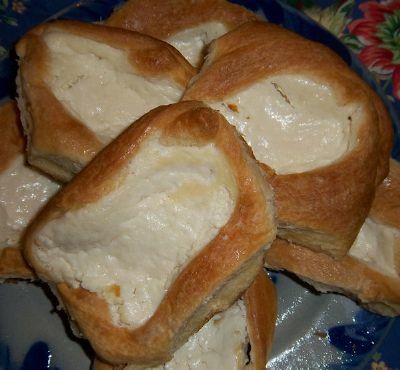 Plus, I think we'd eventually like to eat what's inside. These suckers won't budge!! HELP! Run warm water over the lids. They should come off easily. Another question: Several of the bands discolored during processing. They're not rusted, they just turned a blackish color. Are they still okay to use, or should I plan on using them for a craft project? Thanks so much! Oh, our Wal-Mart has mini-Christmas lights on clearance for 10 cents a box. We spent a whopping 40 cents. I love having little white lights around my windows,etc. I LOVE the way your pumpkin turned out! 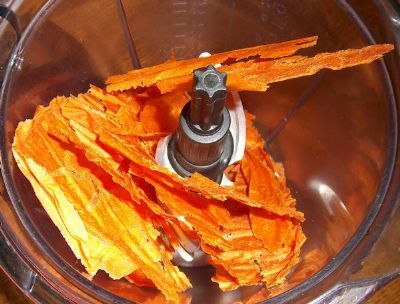 What kind of dehydrator do you have? We have a couple that are sub par, at best. Lisa - it's an Excalibur 9-tray. I absolutely LOVE it. Our son was telling one of the guys at work about it last summer, but he wasn't impressed. He said, "Awwww, that's cute," and then proceeded to tell him about HIS dehydrator, which apparently is the size of a refrigerator. They hunt for all their meat and have a HUGE garden, so they needed something much larger than my "puny" one. I would LOVE to see his in action, wouldn't you??? Anyhow, the pumpkin in the jar smells as fresh as when I first cooked it - yum! 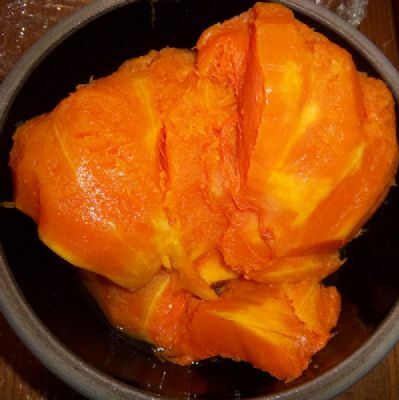 And the great thing is, it loses very few nutrients when dehydrated, as opposed to freezing or canned pumpkin, both of which loses a lot. 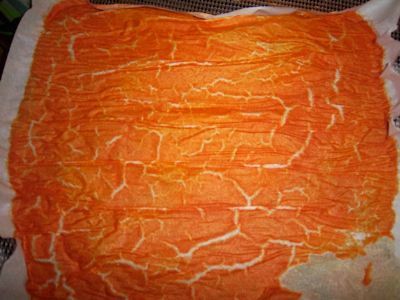 I think dehydrated foods lose a maximum of 5% of their nutrients. That's amazing!!! I just have to share with all of you, too... My Mom sent me a pair of Ove Gloves for my birthday... They are AWESOME!!! My Mommy rocks! Now my food may burn, but my hands sure won't! LOL! Nini Love the pumpkin dust!! That's amazing! I can't wait until our contract is done in August so we can reduce lines. Good for you! We have an LEM dehydrator, it is 10 trays with a timer and thermometer. I got it for $167.00 including free shipping through Amazon about a year and a half ago. I love it. Let's see, this week I could kick myself because last week someone was set up in a parking lot selling 40# bags of Russet Potatoes for only $10.00. I didn't get them and now I wish I did. I have my money in pocket in case I see them again. I researched freezing oven fries so that will be where most of them will go as well as sharing. I hope I have opportunity again. ~I went thrifting and found a book on Hummingbird Gardening for 25 cents. I love how the feeders look and Michael bought me a couple of really nice ones, but I cannot keep up with the wasps and ants, not to mention being totally grossed out when cleaning them and finding earwigs! Eeeewww! So the plan is to grow plants that will attract the Hummingbirds. ~I purchased a 20# bag of Germ-Aide Cereal. It is better than Cream of Wheat and all natural from our local milling company. It ended up costing me $13.00 which is such a killer deal. I have some in a container in the fridge and the rest in the freezer. This and the flour I buy from them all come in flour sacks which I reuse for crafting, to slip my non-stick pans in to protect and for other things. They sure are cute! ~I had some Rosewater that was about half way full in the spray bottle so I added distilled water to it to stretch it. I like to spritz my face with that after washing. I love that you use Rosewater in that way, Sharon! Just love that!!! I've been wondering how Germ-Aide is... I'm definitely going to have to try it now! Thank you for sharing! I just love Cream of Wheat - it's one of my favorite winter comfort foods! I'm with you - earwigs - Ewww!!! What a neat blog - she has so many great ideas! Thank you for sharing!!! The Germ-Aide Sharon mentioned is milled in our local flour mill . . . Cortez Milling in Cortez, CO. It is REALLY GOOD!!! Also very inexpensive. You may not have the same product in your store, unless it is shipped to you from here. Thanks, CJ! I just checked, but their website seems to still be in the development stage? Hopefully we will be able to order from them in the future... I wonder if I could call??? I am loving the Prudent Homemaker website. Lots of good info, and recipes there. Thanks!!! Me, too... I am very happy to say I do a lot of what she recommends already! WOW! I never realized all the things I do to save! Cool! I was really surprised at the price differences between the different regions, as well. We noticed that immediately when we relocated from RI to PA - BIG adjustment to our diets, truly! And I am almost ashamed to admit that we eat very little rice and rarely touch beans (other than canned refried beans and kidneys in chili). I would really like to learn how to do more of that. My hubby has, ahem, "issues" with beans, so I have always avoided them - if for no other reason than to simply be able to breathe at night! (Bean-o doesn't stand a chance against his digestive tract, either!) I sure would like to start incorporating more of them, though. That bean burger looks fabulous! And you know what else? I have a big jar of quinoa in my cupboard, and have no idea how to use it. I made a chicken recipe by MaryJane once, and loved it, but other than that, I have NO idea what to do with it! Okay girls - please "enlighten me" with your bean and quinoa suggestions! I need help!!! I am glad that you are gleaning from that blog. Nini, I was happy to see that I also did alot of the things she suggested. 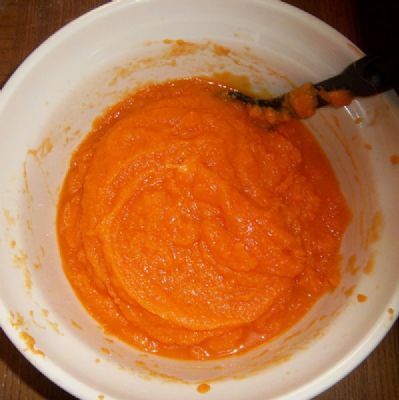 Puree beans and chicken broth in a food processor or blender. Set aside. In a large skillet, heat oil over medium heat, and when hot, add red onion, bell pepper, zucchini, and garlic. Sauté vegetables, stirring, until soft, about ten minutes. Add corn, cumin, cayenne pepper, and salt; cook another two or three minutes. Lightly oil an eight-inch spring form pan. Preheat oven to 375 degrees. Place one flour tortilla in bottom of spring form pan. Spread ½ cup of the bean puree over tortilla; top with one cup of the sautéed vegetable mixture; spoon 1/3-cup salsa over the vegetables; sprinkle 1/3-cup cheese over salsa. Repeat with remaining ingredients ending with cheese. Bake for 45 minutes; let stand five minutes before cutting into wedges. Garnish each wedge with a dollop of sour cream and chopped chives or scallions. Serves ten to twelve. Nini, did you get my e-mail? Here is a quinoa recipe I like. Cook quinoa like this: Mix quinoa and water or broth in a saucepan. Bring to a boil, then reduce to a simmer and cook for seven minutes. Fluff quinoa with a fork and set aside. Remove greens from radishes, chop the roots off and slice thinly. Remove the peas from the pods and set aside. Make he pesto by chopping up the basil in batches. Some of it will be more finely cut than the rest. Once all of it is somewhat chopped, add half of the cashews and chop for a minute or two. It will not be as fine as store-bought pesto, but that's the point. Add the rest of the cashews and half of the cheese and chop for a few more minutes. Add the garlic and the rest of the cheese and chop all until it is to our liking. Put the pesto in a bowl and pat it into a ball of sorts. Pour the olive oil over it. If you have time, let it sit in the fridge overnight so the olive oil slowly absorbs into the mixture. If you don't have time, mix it all together. This will make extra pesto to freeze. Spoon pesto into an ice cube tray. It will keep for up to six months in the freezer. Mix the cooked quinoa, 1/4 cup pesto, shucked peas and sliced radishes together in a dowl. Keep chilled in the fridge until ready to eat. Vegetarian - Serves 4 - 6. This is really good in the summer when I usually want something substantial but not necessarily cooked up hot. Wow Marie, that sounds delicious! Every Wednesday, I buy dinner at an oriental restaurant near to a store where I go to play games. I get the hot and spicy soup which costs only $2.10 per pint. It is good soup and I get it in this really durable plastic container. It has a tight-fitting lid so it is good for liquids. The one pint size fits nicely in the fridge or the cupboard. Mmmm.... Those recipes DO sound yummy! Thank you, girls! If any of you use Wilton plastic disposable frosting bags, just wash and reuse. I know they're quite expensive. I bought a basic Wilton kit on eBay that came with the bags. I shopped my local thrift store last Monday coz it was senior day .. 10 % discount....but forgot to ask for my discount....so dumb. Anyway I purchased 2 plastic storage bins. The ones that don't have a front used for kids toys.....I am repurposing them into the chicken coop for laying beds. I added the hay and supported the front so the bins don't tip over and the girls love them. One is blue and one is red....I think I will be painting the walls as off white so it will have a patriotic theme. Today is Saturday and when I dropped in to find more bins there were none......but I found 2 different sets of small lamp shades for .59 cents per shade. Brand new and no blemishes. Also the bins cost .59 cents. I like a bargain!!! It's that time of year to negotiate with centurylink. I was paying 89 for phone/internet. Told them cable company had better deal, it was cheaper, faster ect. So with the saying " what can you do better"? I got free long distance, faster internet speed for $60 a month. That's $20 plus savings a month. No contract either. Tara, good for you, I need to call centurylink and negotiate.